Now the shocking news from IT world, just on February, 2014, Facebook acquired WhatsApp for US$19 billion which included $4 billion cash, $12 billion in Facebook shares, and additional $3 billion as stock units for the WhatsApp founders. It's Jan Koum and Brian Acton, two best friends who built and developed WhatsApp Messenger are lucky to have their application is bought by Facebook, and unlucky for Facebook to had bought it.. Why? Actually, Koum and Acton were former Yahoo staff and exited the job in 2007 to develop WhatsApp. 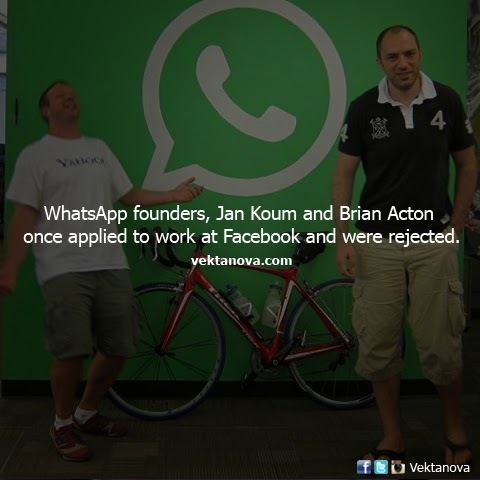 It was Koum who actually found the first WhatsApp development until Acton came in to help. But suddenly they got tired in the process of developing and started to find a new job instead. They tried to apply new job to Facebook, that company which later bought their WhatsApp worth US$19 billion, after some wait, they were rejected by Facebook. No other way, they continued making WhatsApp after realising that owning an application for Apple devices is a promising way. No response yet to "WhatsApp and Facebook"